Featured Apps, Prize Scams, More! 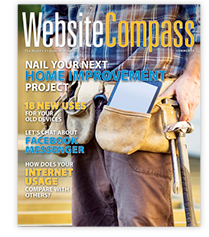 Whether you're planning to do a little painting or a lot of renovation, keep the Summer 2018 Website Compass magazine in your toolbox. Its feature article is packed with home improvement resources to help you successfully plan and complete your project. Other topics in this issue include new uses for your old devices and how to take advantage of Facebook Messenger. You receive Website Compass as a value-added bonus for being one of our internet customers. You can access it at this link. Believe it or not, Cycle Ball is a real sport. Watch these talented players deftly maneuver a ball into nets — all while riding bikes! Have you ever wondered how spider webs are created? This video solves the mystery by showing a spider patiently spinning one. Watch TV When You're Out & About! 3 Rivers' own TV service— 3RTV Digital TV— includes FREE Watch TV Everywhere service! If you're traveling this summer you'll still be able to keep up with your favorite TV shows on any device— tablet, smartphone or PC— FREE with your paid subscription to 3RTV! If a network is part of your 3RTV package, you have access to that network's available TV Everywhere content anywhere with an Internet connection. And 3 Rivers' Watch TV Everywhere service includes HBOGo® for HBO® subscribers! Visit 3rivers.net for information on how it works and to get started if you haven't signed up yet (you'll need the account number that appears on your bill for the initial registration process)! Not a 3RTV subscriber? Give us a call today and find out how you can add TV to your 3 Rivers phone and Internet service and pay just $99 a month for 6 months—for all 3 services! More than just recipes, this app features stories about food, how-to videos, a shopping list, and a community of fellow foodies. Heading out for dinner? Bring Yelp with you. Read reviews, view photos, see menus, get directions, or find out what's nearby. This app provides GPS audio walks that let you explore landmarks — like San Francisco's Golden Gate Park — in a whole new way. google.com/streetview/ – The title Street View is misleading for this Google Maps feature. You can also use it to check out islands, oceans, parks, resorts, landmarks, and cultural sites throughout the world. These real-life 360-degree shots allow you to virtually visit places you may never otherwise experience. icecreamhistory.net – Did you know the U.S. is the largest producer and consumer of ice cream in the world? July is National Ice Cream month, and a great time to enjoy everyone's favorite sweet, creamy treat. Get the scoop by visiting this site to learn history and facts as well as how it's made. 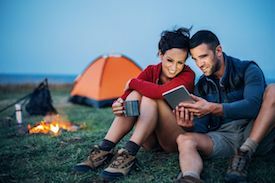 recreation.gov – Check out this site to search for campgrounds, parks, and tours around the U.S. Not sure where you want to go? Try the Explore Trip Ideas section to discover places you might not have considered. Or go to The Go List for ideas on wilderness backpacking, how to camp with kids, and more. fix.com – With an extensive collection of how-to articles on a wide range of topics, this site can help you solve just about any everyday problem you may have. You'll find tips on everything from home improvement to exercise, so stop here for help with many of life's little challenges. Short Tutorial/FAQ – Is There A Way To Avoid Seeing Online Targeted Ads?